It has very high defense, and can only take damage in the face. Attack the face! If caught by its snag laser, use the reaction command Bolt Reversal continuously to escape. If successful, a big explosion will unleash damage upon nearby enemies. 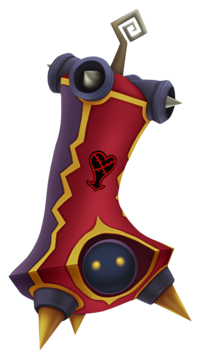 The Bolt Tower is an Emblem Heartless that is found in Kingdom Hearts II. The Bolt Tower has a spherical black head with glowing yellow eyes. Its head is placed near the base of a tall, vaguely pyramidal structure that surrounds it. This apparatus is predominantly red with yellow and lavender patterns decorating its edges. Four large, conical, yellow spikes are set in its base, and three smaller, silver ones adorning its top. It also has a curled, brown antenna on its top, similar to the tip of the Yellow Opera's hat. Its Heartless emblem is on the front of the structure, above the Heartless's head. In the Land of Dragons, the Bolt Tower's color scheme changes greatly. Its body becomes primarily grey with gold sections and red highlights at its top and bottom. The spikes at its base become grey, while the ones at its top turn red. Its antenna becomes a lighter shade of brown, closer to grey. The Bolt Tower's Heartless emblem is now surrounded by large gold diamond with concave, red edges. This diamond is superimposed over a series of rectangular patterns with the same color scheme. The overall design is meant to reflect ancient Chinese architecture. The Bolt Tower's name references the bolts of electricity it can fire. "Tower" refers to the Heartless's tall stature. The Bolt Tower fires blasts of lightning from its top. They are slow, but can be very deadly when in large groups. Aim for their heads to hurt them, and watch out when it raises up high in the air; this means a large shockwave is coming. The only way to dodge the shockwave is to jump at the time of the attack. Thunder magic will do no harm to these Heartless, so use other forms of offensive magic or physical attacks. The Bolt Tower also has a Reaction Command, called Bolt Reversal. If Sora successfully uses Bolt Reversal, he can take out other Heartless with the blast. This does not work in the Pride Lands, however, because Sora is in Lion Form. The Bolt Tower as it appears in The Land of Dragons. This page was last edited on 6 September 2018, at 22:01.